There comes a time for all us when we have to make a stand. Maybe we are backed against wall or faced with impossible decision. Either way we are forced to bet on ourselves. We choose a path and walk down it confident that we have made the right choice. Many of us have had to traverse many crossroads in life. These particular fighters are at a crossroad in their respective careers. Down one road is another shot at glory, relevancy, big paydays and title opportunities. Down the other is the path to mid-level purgatory. Labeled as a gatekeeper, a hype job, wasted potential or stepping stone fighter. 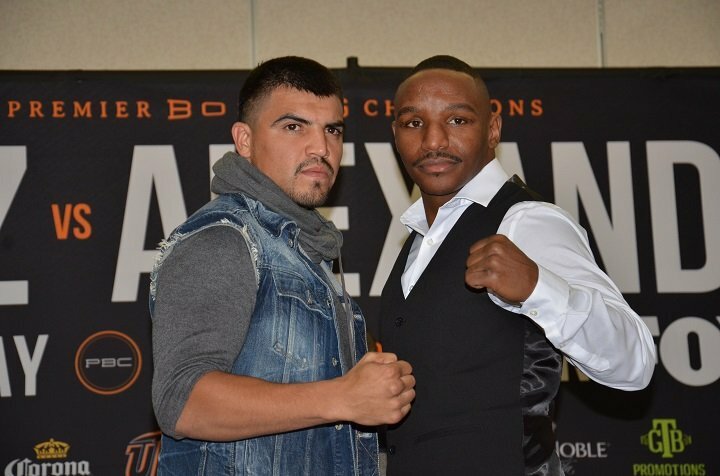 Devon Alexander vs Victor Ortiz is a fight where the two men involved are at that crossroad right now. Both of these men need a win. Both of them want to get back to the top of their division. Both were once labeled as future heirs to the throne at 140 or 147. Now they are fighting to reclaim that lost glory. Below we break down these fighters and how they got to this point in their careers. Victor Ortiz is one of the most polarizing figures in boxing. People either love him or hate him. Victor Ortiz is an exciting young man with a come forward, crowd pleasing style. He is also marketable and handsome. He has crossover appeal being involved in such projects as The Expendables 3, Dancing with the Stars and Hawaii 5-0. He is never in a boring fight and has an incredible back story. His problem seems to come from the fact that he has mentally checked out in his biggest fights. He can be accused of quitting against Marcos Maidana and Josesito Lopez. He fouled and then hugged Floyd Mayweather. For someone who was once considered to be the heir to Oscar De La Hoya. He star has dulled a bit .He has lost 4 of his last seven fights. Also he has only fought once a year in the last 4 years. His last fight was in July of 2017. A knock out victory over over Saul Corral. In order to get his career back on track he has to beat Devon Alexander on February 17 in El Paso, Texas. Devon Alexander is a slick and smooth southpaw boxer. He can punch. He has good defense but does not run. He boasts a good chin as well having never been knocked out. He will pretty much fight anyone. Alexander has just a stretch of bad luck. His career started with a ton of hype thanks to his impressive 300-10 amateur record. He lived up to the hype early winning his first 21 fights. Beating men like Demarcus Corley and Juan Urango. His first setback was a loss to Timothy Bradley. A fight with numerous accidental headbutts by Bradley. However Alexander rebounded to four straight. Including beating Lucas Matthyse and Marcos Maidana. The Maidana fight looks even better in hindsight given what he has accomplished and how thoroughly Alexander beat him. However following a loss to Shawn Porter and then two straight setbacks against Amir Khan and lightly regarded Aaron Martinez one has to wonder if his best days are behind him. Alexander needs this win to regain his momentum and status in the brutally tough welterweight division. On February 17 in El Paso Texas two men will go to war trying to keep their careers afloat. Lots of questions will be anwsered. Ir Ortiz a shot fighter? Are his Hollywoods project distracting from his boxing? Was Devon Alexander overrated. This fight will anwser all of those questions and more. I for one am excited to see who gives himself the chance to resurrect his career. Next boxing news: BJ Saunders vs Martin Murray: A good fight or a predictable fight?